A light reception will immediately follow this event. 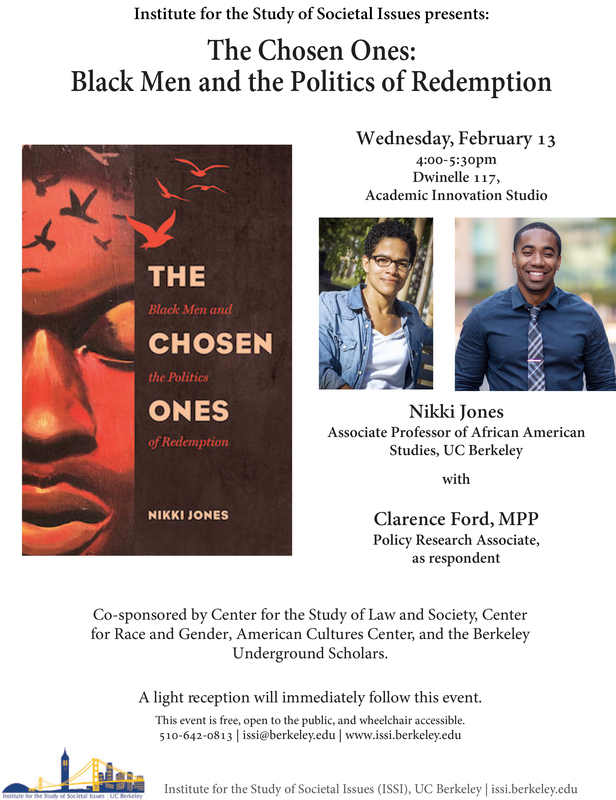 Nikki Jones is an associate professor in the Department of African American Studies at the University of California, Berkeley. Her areas of expertise include urban ethnography, race and ethnic relations and criminology and criminal justice, with a special emphasis on the intersection of race, gender, and justice. Her research appears in peer-reviewed journals in sociology, gender studies, and criminology. Professor Jones’ books include Between Good and Ghetto: African American Girls and Inner City Violence (2010), published in the Rutgers University Press Series in Childhood Studies (betweengoodandghetto.com), and The Chosen Ones: Black Men and the Politics of Redemption (University of California Press, 2018). Professor Jones is the past-Chair of the American Sociological Association’s Race, Gender and Class Section (2012-13). She also serves on the editorial boards of the American Sociological Review and Gender & Society. 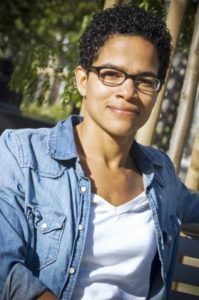 Jones has received awards for her research and publications including the William T. Grant Award for Early Career Scholars (2007-12) and the New Scholar Award from the American Society of Criminology’s Division on Women and Crime (2010) and Division on People of Color and Crime (2009). Before joining the faculty at Cal Professor Jones was on faculty in the Department of Sociology at UC-Santa Barbara (from 2004-2013). She earned her Ph.D. in Sociology and Criminology from the University of Pennsylvania. Clarence Ford is a Policy Research Associate at the Burns Institute, where he focuses on recent developments in research, legislation, and analyzes data to understand the impact of justice system decision making on people of color. Clarence brings lived experience to the justice reform movement. After being released from incarceration, he became a community organizer/policy advocate in Richmond, CA focusing on the removal of barriers in the reintegration of formerly incarcerated peoples. It was through his organizing experience with the SafeReturnTeam that he became politicized and learned how to use his juvenile hall and prison experience as a catalyst for change in social justice. 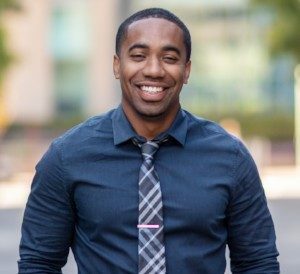 After transferring to the University of California, Berkeley he became a policy advocate for the Berkeley Underground Scholars, a student led organization of formerly incarcerated and system impacted students on campus working to expand the prison to school pipeline. There he helped to successfully spearhead a Ban-the-Box campaign for UCB, which later became an adopted practice at all UCs. Ford is a Berkeley Double Alumnus, he received his BA in American Studies and more recently his Master’s in Public Policy this past May. For more information, please contact issi@berkeley.edu or (510) 642-0813.